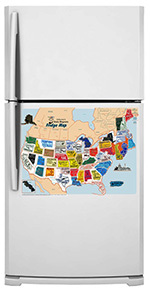 Our magnetic State Magnets USA Map Collector’s Board includes 50 state magnets, Washington DC and Puerto Rico, that can be put in place on the metal board, creating a fun way for children to learn the geography of the United States. It's great for use during quiet times at home and for help in geography class. Completing the map of the USA with the state magnets has never been more fun and exciting! Please note that it is not a puzzle map.